(WASHINGTON, D.C.) – The Internet Security Alliance (ISA) announced today that it will release a new handbook to assist corporate boards of directors in the United Kingdom in managing their companies’ cybersecurity risk. Based on the U.S. Cyber-Risk Handbook from the National Association of Corporate Directors (NACD), the new handbook will be unveiled at NACD’s Global Cyber Forum in Geneva, Switzerland on April 17-18. 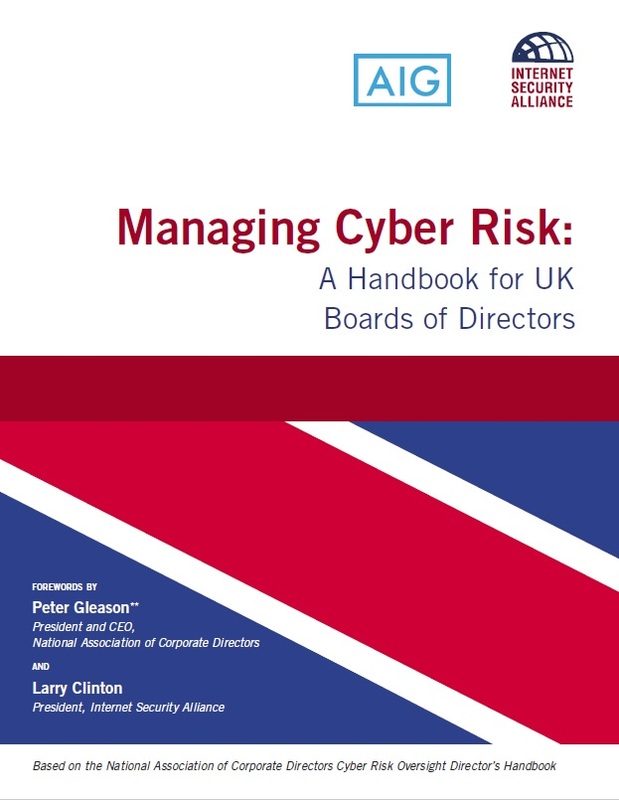 The new handbook – which was developed in partnership with American International Group, Inc. (AIG) –offers boards important information about the legal landscape for cybersecurity in the UK, including the impact of the European Union’s General Data Protection Regulation and other emerging legal and regulatory trends in UK, including transparency requirements and security standards. The handbook addresses sanctions that are in place for non-compliance with cybersecurity requirements in the UK, as well as considerations for publicly traded companies, corporate governance, and the role of legal counsel on cybersecurity issues. It also details how corporate boards can create an overall approach to cyber-risk management at their companies, among other topics. The UK handbook will be released alongside a German edition of the Cyber-Risk Handbook, which was announced on March 30 and has received the endorsement of the German government’s Alliance for Cyber Security.